We sell a range of fireplace products and stove accessories including wooden mantels, log holders, companion sets and products for stove maintenance. Complete your fireplace with a floating oak mantel. They are available in a number of finishes, and can be made to size so that they are a perfect fit for your fireplace. 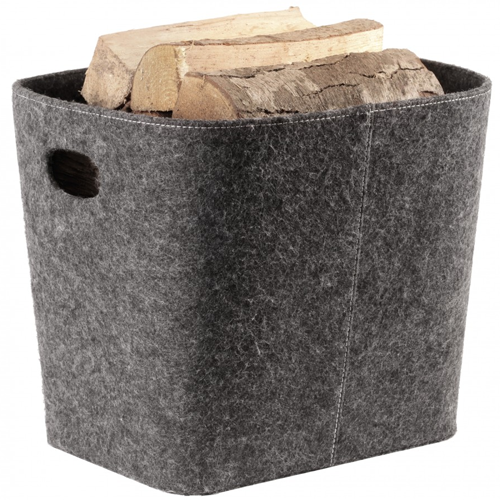 Handles at either end make it easy to transport logs in this modern felt log holder, a great alternative to traditional wicker log baskets. Best kept on the stove pipe, stove thermometers will help you to understand when your stove is burning most efficiently, when too low (creating creosote which can damage the flue) or too high (which can damage the stove). A range of vitreous enamel hearths and heat shields. From plain colours, to patterns and bespoke designs, Vlaze provides a beautiful finish for your stove installation. 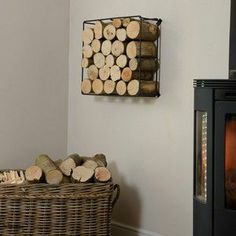 Wall hung, or sat on the floor, this modern and extremely sturdy log holder will look beautiful next to your stove, and has a large capacity for storing logs. With its clean, curved and contemporary design the Aduro Baseline 1 companion set includes four tools, a shovel, brush, poker, tongs and stands 660mm high. Ensure your home is safe with a carbon monoxide alarm with a 7 year life span. The square log holder is perfect for those looking for a modern finish, but more compact log holder. It can be wall hung, or looks equally stylish floor standing. A unique and contemporary companion set designed by the Danish architect Casper Storm. The set consists of a stand, poker, brush and shovel. We stock VITCAS fire cement (£4), VITCAS stove glass cleaner (£7.50), VITCAS black high temperature paint (£10) and VITCAS 8mm and 12mm rope kits (£10 each).